I always like the CC trailers with the stopper on the front, has anyone tried modding a Malibu trailer. I have an 05 Boatmate single axle with the swing But I don't think I can do it anyone care to speculate? Here are some pics in this link. You have to be logged in to see it, but those are crash pads. You can get them as an option on most trailers, I had them on a DHM at one point. If you really want them, you might contact Boatmate & see if they have a kit. Don't get one for your trailer, they are a huge PITA! Lest say you want to put your cover on, you have to either pull your boat back a few inches (impossible) or you have to lower that front craddle. Onc you have lowered it unless you are superman there is no way that it is going to go back up. You have to then take the boat down the ramp, float it, and then push that thing back into position. It serves no functional purpose and is just plain annoying!!! Don't hold back, tell us how tou really feel! No doubt! Seriously though, I never had a problem getting the cradle hooked back up after pulling it forward, but it does create a large obstacle when trying to detail the boat or like JSP said, put a cover on it. 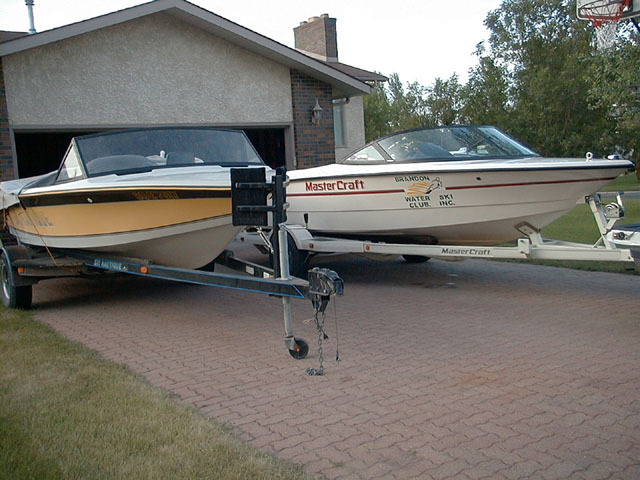 I also don't think that it does any better at positioning the boat correctly on the trailer. A good bow roller & carpeted v-bunk up front will do you just as well IMO. You are lucky! If we let ours down it doesn't line back up because the boat is to far forward on the trailer. Its only off by a fraction of an inch, but thats still enough for the pin to not be able to go through.